Norumbega Farm will be hosting an exhibit of quilts and prayer flags by Ellie Fellers and Sharon Vandermay of New Gloucester during the month of November. 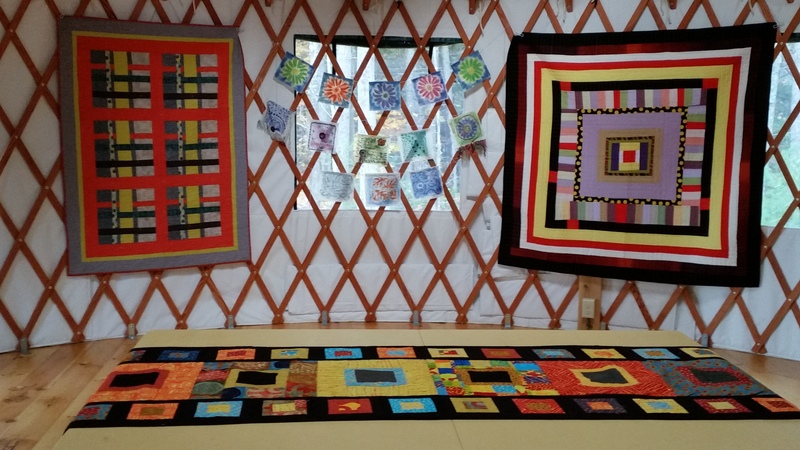 The quilts and prayer flags will be on display in the Norumbega Yurts on Saturday November 5, 12 and 19 from 10 am to 3 pm; and on Sunday November 6, 13 and 20 from 1 pm to 4 pm. There will be an opening reception on Friday November 4 from 3 pm to 6 pm with hard cider provided by Norumbega Cidery. On Saturday November 5 at 11 am, Ellie and Sharon will host a “quilt talk” where they will discuss their various quilting styles and techniques. Natural Body Products Workshop by Laura Fralich — November 12 from 10 am to noon. Make lip balm, hand and facial salves and scrubs with natural materials. Prayer Flag Workshop by Sharon Vandermay — November 19 from 10 am to noon. Learn to make prayer flags. To register, call or email Julie Fralich — 207-653-4823 or j.fralich@gmail.com. The yurts are at 380 Woodman Rd. Look for signs to Norumbega yurts and Norumbega Cidery. Follow dirt driveway that goes up along our pasture, around a big rock and proceed straight ahead to yurts. Park along driveway near yurts.